Happy day where you can eat chocolate for breakfast and no one judges you!! Except for your waistline. Luckily this week I have been trying to get back into a regular exercise routine, so I don’t think my little treat from the surprise Easter Bunny will do too much harm. I am home dog-sitting (Megs is lucky I have no Easter Bunny ears to use for photo ops), and the people I live with thoughtfully hid an Easter treat for me before they left! 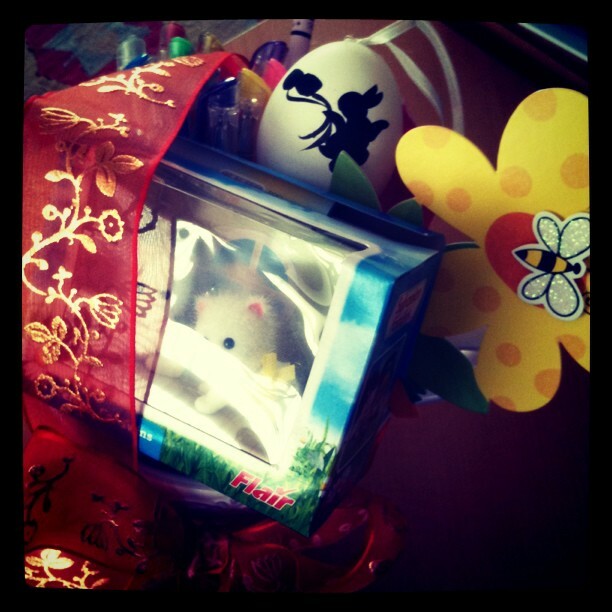 So amazingly sweet and a super pleasant surprise when the Easter Bunny sent me on a hunt via email this morning! It is my first Easter ‘alone’. But it has been pretty rad so far. Woke up to copious amounts of church bells saying: Hey! The time changed last night and you have slept in – time to get up to this beautiful music. So far it has just been a wonderfully chill Sunday. Minimal physics homework to come, and of course just enjoying the sunshine. No paskas or morning snow in Copenhagen for Easter this year, but I am totally ok with that and enjoying every minute.